Theewaterskloof Dam on 11 May 2017. The City of Cape Town has urged residents to watch their water usage as consumption steadily increases amid dropping dam levels. 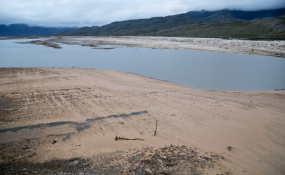 "Dams that supply Cape Town have declined by 1.6% over the past week to 57.4% of storage capacity," the City said in a statement on Monday. Conversely, the average water consumption has gone up by 19 million litres per day to 633 million litres per day. "While we remain within our allocated allowance of 650 million litres per day, we need to exercise caution and continue with water-wise behaviour," the City stated. Although the situation is not as severe as last year when there were Level 6B restrictions, Level 3 restrictions are in place. - No hosepipes or sprinklers are allowed.